Explanation: The Crab Nebula is cataloged as M1, the first on Charles Messier's famous list of things which are not comets. 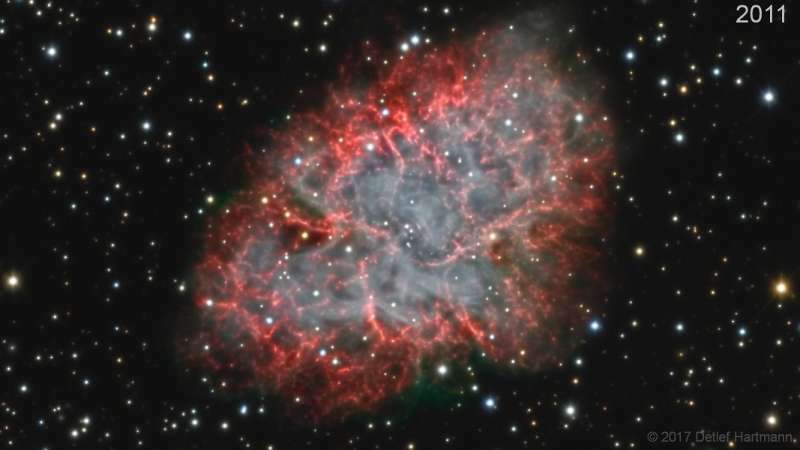 In fact, the Crab is now known to be a supernova remnant, an expanding cloud of debris from the explosion of a massive star. The violent birth of the Crab was witnessed by astronomers in the year 1054. Roughly 10 light-years across today, the nebula is still expanding at a rate of over 1,000 kilometers per second. Over the past decade, its expansion has been documented in this stunning time-lapse movie. In each year from 2008 to 2017, an image was produced with the same telescope and camera from a remote observatory in Austria. Combined in the time-lapse movie, the 10 images represent 32 hours of total integration time. The sharp, processed frames even reveal the dynamic energetic emission within the incredible expanding Crab. The Crab Nebula lies about 6,500 light-years away in the constellation Taurus.